These photos were taken a while back before summer hit when I didn't have a clue what to wear because the weather kept changing daily: hot, cold, hot, cold. Finally I threw this on and it worked! 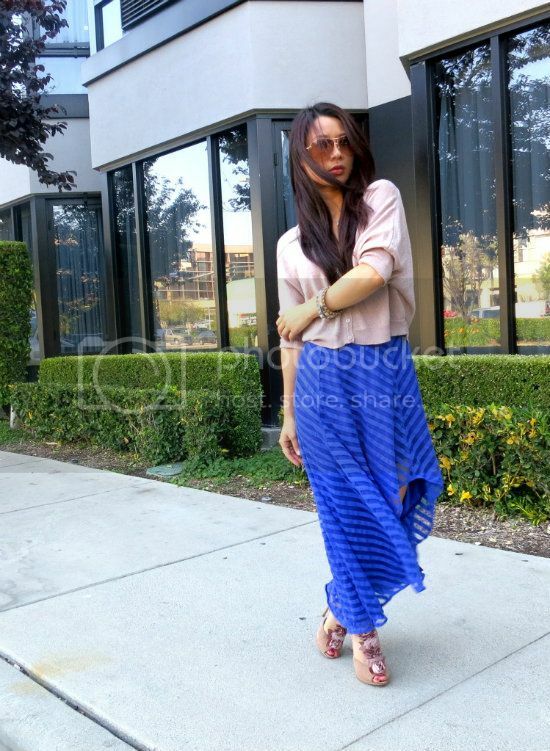 The perfect cold-to-hot transition outfit: sweater top paired with a maxi skirt. I wore my sparkly Charlotte Russe sweater over an FE high-low skirt (last worn here). It was still a little boring to me so I turned the skirt sideways and voila! It became a totally different, totally new asymmetrical skirt! And you know what? I actually like it better this way! Lesson of the day? When you can, have fun with your clothes and find out new ways to wear it. What a gorgeous skirt! I love the hem! love how this is caual and dressy all at the same time. Fab blog! Beautiful skirt! I love the look! I may have fallen in love with your skirt. It's a great color, and the asymmetrical hem is awesome. That blue skirt is sooo pretty!